Our beautifully furnished villa stands on one third of an acre corner plot, with magnificent landscape gardens making a special place to spend your holiday. The westerly facing pool has the sun form morning till dusk. It has a large shaded lanai area with sun loungers, table and chairs and barbecue. 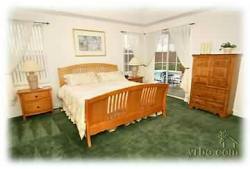 Two Master Kings which have a top quality King sized beds each with ensuite with walk in shower and corner bath. One Master Queen with shared ensuite and two Twin rooms one of which is themed. Family room with large Tv, Dvd player and Cd player. The french doors lead out onto the lanai area. Dining area looks out onto the pool, with a large bay window. Sitting room is quiet area overlooking the beautiful gardens. Games room includes full sized pool table, Airhockey, X-box entertainment system and other games. All rooms are air-conditioned with additional ceiling fans. 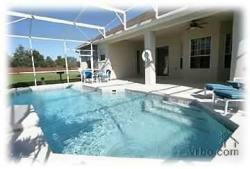 New five bedroom villa on this much sought after estate which is the closest to the Disney parks. The master bedroom has a huge American king size bed with a lovely large ensuite with twin vanity basins, separate shower stall, marble bath. separate water closet. This bedroom overlooks the pool and has direct access poolside.This bedroom also has a large tv. The second master has a king bed with adjoining ensuite with bath, over-bath shower wash basin and water closet. 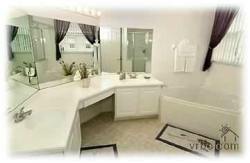 The other three bedrooms are a queen and two twins which share a third bathroom . Large lounge with comfortable seating and large screen cable television. Dining area with a lovely light american dream kitchen.There is also another comfortable lounge with double sofa bed at the front of the house. The gorgeous 30 foot pool is westerly facing and enjoys the sun from mid-morning till sunset and as our villa is a corner plot the pool is not overlooked. Plenty of sunbathing area as well as a shaded lanai for those very hot days. A baby cot/crib,high chair and play pen/yard are also available. We have stayed in villas all over Kissimmee but this is the best and nicest location with large spread our lots and top of the range fixtures and fixings. 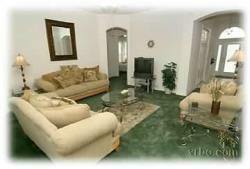 You will not be disappointed with our beautiful home and, like us, you will not want to leave to go home! Balance to be paid - 11 WEEKS PRIOR TO H to arrival.